On a Friday afternoon in January, a few parents and two ministers gathered at Medard Nelson Charter School at the corner of St. Bernard Avenue and Gentilly Boulevard hoping there was something they could do to keep the school open past May. They were meeting with State Rep. Joe Bouie, a well-known critic of New Orleans’ use of charter schools. Somewhat unexpectedly, Michelle Blouin-Williams walked into the Parent Teacher Organization meeting, which was being held in Nelson’s library. She is the CEO of the New Beginnings Schools Foundation, a nonprofit that operates Nelson and two other schools. Her answer seemed to take Davis by surprise. As students and teachers were searching for new schools and new jobs, the charter management group’s central office staff will likely remain largely intact. It will still operate two other schools. 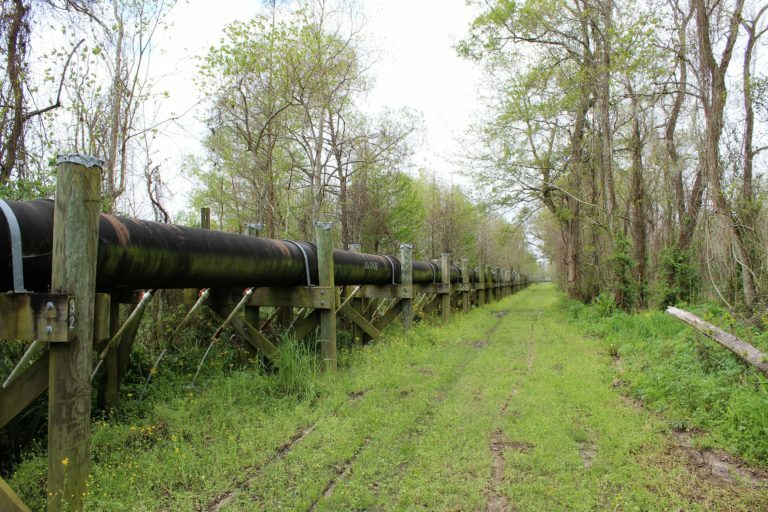 A site south of Ponchatoula is dead center in a lengthy debate over a controversial wastewater treatment technique. And the city of Hammond, though it lies well seven miles to the north, is deeply involved in that debate, thanks to a treatment system that discharges the city’s wastewater into protected marsh. On either side of the debate are residents and stakeholders who each say they have science on their side. And watching from Baton Rouge are two state agencies responsible for permitting Hammond’s so-called “wastewater assimilation” operation. Both are reviewing the city’s effort to build and maintain a wastewater pipeline — which runs from Hammond to the site along the marsh — and its struggles to keep its discharge within safe, legal limits. The Lens has confirmed that the agencies — the Department of Environmental Quality and the Department of Natural Resources — are investigating Hammond’s wastewater assimilation system after several years of shortcomings in treating the water that it discharges at the edge of the Joyce Wildlife Management Area. The New Orleans City Planning Commission on Tuesday approved the language for a much stricter regulatory regime for short term rentals. The amendments now go to the City Council for a final decision. The recommendations from the commission were more restrictive than the ones proposed by Councilwoman Kristin Palmer late last year. Like Palmer’s version, whole-home rentals in residential neighborhoods would be limited to homeowners with homestead exemptions. But while Palmer’s proposal allows those homeowners to rent up to three whole units on their property in any residential district, the commission’s staff recommendations only allow for one in most residential neighborhoods. The Orleans Parish District Attorney’s Office is appealing a ruling by a federal judge last month allowing a federal civil rights case over prosecutors’ use of fake subpoenas and practice of seeking arrest warrants against crime victims and witnesses. Attorneys representing Cannizzaro and 11 assistant district attorneys named in the suit on Tuesday filed a notice in federal court that they will appeal the ruling to the 5th U.S. Circuit Court of Appeals. “Victims of domestic violence and/or sexual assault can get treated so differently in New Orleans it makes my head spin. How’s this for polar opposites: some crime victims are offered sensitive care and confidential counseling supervised by medical professionals. A few blocks farther up Tulane Avenue, others — mind you, we’re talking victims not perpetrators — have been thrown in jail and held on whopping bonds without a lawyer. The Orleans Parish school district has issued its most severe warning to James M. Singleton Charter School for the third time this school year for again violating federal and state special education law, officials say. District officials cited “systematic and student-specific non-compliance” when it came to providing special education services. The Central City charter school is overseen by the nonprofit Dryades YMCA board, a unique set-up for a New Orleans school. The district’s Senior Equity and Accountability Officer Kelli Peterson and her team began their inquiry after a parent contacted the district in mid-January with concerns about a student not receiving services in their Individual Education Program (IEP). An IEP is a contract between the school and parent that outlines special education services.